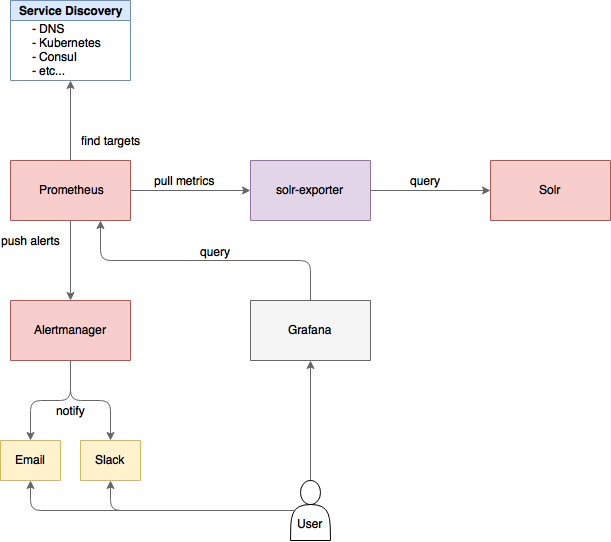 If you use Prometheus and Grafana for metrics storage and data visualization, Solr includes a Prometheus exporter to collect metrics and other data. A Prometheus exporter (solr-exporter) allows users to monitor not only Solr metrics which come from Metrics API, but also facet counts which come from Searching and responses to Collections API commands and PingRequestHandler requests. This feature is considered experimental, meaning future improvements may break compatibility. The Prometheus exporter is included in Solr as a contrib, and is located in contrib/prometheus-exporter in your Solr instance. Modify the solr-exporter-config.xml to define the data to collect. Solr has a default configuration you can use, but if you would like to modify it before running the exporter the first time, see the section below Exporter Configuration. Start the exporter from within Solr. See the section below Starting the Exporter. You can start solr-exporter by running ./bin/solr-exporter (Linux) or .\bin\solr-exporter.cmd (Windows) from the contrib/prometheus-exporter directory. Displays command line help and usage. The port where Prometheus will listen for new data. This port will be used to configure Prometheus. It can be any port not already in use on your server. The default is 9983. The Solr base URL (such as http://localhost:8983/solr) when Solr is running in Standalone mode. If you are running Solr in SolrCloud mode, do not specify this parameter. If neither the -b parameter nor the -z parameter are defined, the default is -b http://localhost:8983/solr. The ZooKeeper connect string (such as localhost:8983, or localhost:2181/solr) when Solr is running in SolrCloud mode. If you are running Solr in Standalone mode, do not specify this parameter. If neither the -b parameter nor the -z parameter are defined, the -b parameter default is used. The path to the configuration file that defines the Solr metrics to read. The default is contrib/prometheus-exporter/conf/solr-exporter-config.xml. The number of threads. The solr-exporter creates thread pools for requests to Solr. Request latency can be improved by increasing the number of threads. The default is 1. The Solr’s metrics exposed by solr-exporter can be seen at: http://localhost:9983/solr/admin/metrics. The configuration for the solr-exporter defines the data to get from Solr. This includes the metrics, but can also include queries to the PingRequestHandler, the Collections API, and a query to any query request handler. The solr-exporter works by making a request to Solr according to the definitions in the configuration file, scraping the response, and converting it to a JSON structure Prometheus can understand. The configuration file defines the elements to request, how to scrape them, and where to place the extracted data in the JSON template. Scrape the response to a PingRequestHandler request. Scrape the response to a Metrics API request. Scrape the response to a Collections API request. Scrape the response to a search request. The collection to issue the query against. Only used in SolrCloud mode. The core to issue the query against. Only used in Standalone mode. The path to the query endpoint where the request will be sent. Examples include admin/metrics or /select or admin/collections. Additional query parameters. These will vary depending on the request type and the endpoint. For example, if using the Metrics endpoint, you can add parameters to limit the query to a certain group and/or prefix. If you’re using the Collections API, the command you want to use would be a parameter. This is an array that defines one or more JSON Queries in jq syntax. For more details about how to structure these queries, see the jq user manual. See the section Exposition Format below for information about what information should go into each property, and an example of how the above example is translated for Prometheus. The metric name to set. For more details, see Prometheus naming best practices. The type of the metric, can be COUNTER, GAUGE, SUMMARY, HISTOGRAM or UNTYPED. For more details, see Prometheus metric types. Help text for the metric. Label names for the metric. For more details, see Prometheus naming best practices. Label values for the metric. For more details, see Prometheus naming best practices. Value for the metric. Value must be set to Double type. If you already have a section for scrape_configs, you can add the job_name and other values in the same section. When you apply the settings to Prometheus, it will start to pull Solr’s metrics from solr-exporter. 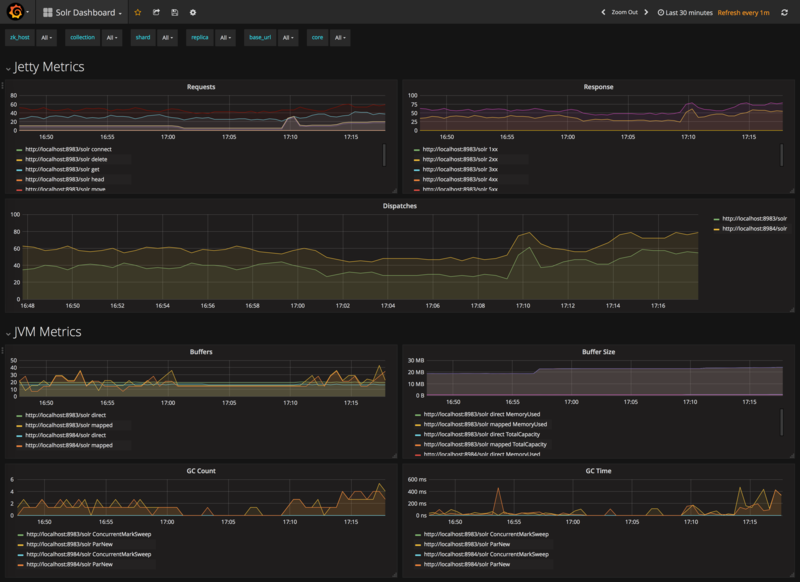 A Grafana sample dashboard is provided in the following JSON file: contrib/prometheus-exporter/conf/grafana-solr-dashboard.json. You can place this with your other Grafana dashboard configurations and modify it as necessary depending on any customization you’ve done for the solr-exporter configuration.